When we bought our current home, (as of this posting date) the previous owners were into that "earthy" style. 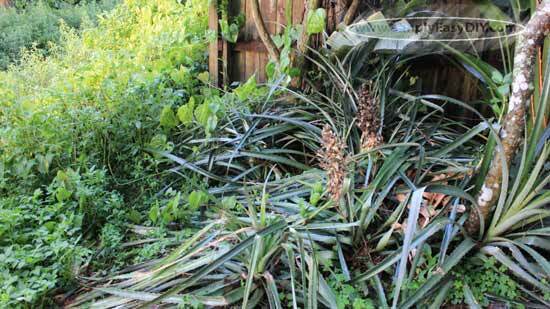 and a bed of pineapples were just some of the foliage they had planted throughout the yard both front and back. So much so that it had become a jungle all to itself due to a lack of upkeep. Having small children meant we were not willing to try and keep many of the thorny varieties of plants. The pineapple and cacti had to go for sure. Also, in case you are not familiar, many citrus trees have thorns as well. So a lot of it had to go. 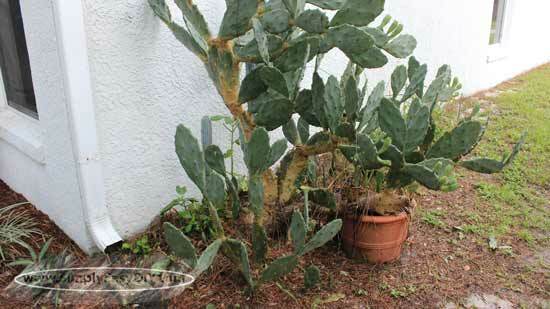 There were 7 trees not including the shrubs, cacti and other low lying plants. One of the trees was a rather large oak that was too close to the house and it's root system we feared was going to soon damage the concrete slab that was the foundation of the house, not to mention the havoc it was doing to the roof. So I called a tree service and they sent someone to take a look and give me a quote. His first response was "whoa!" Instead of charging me per tree he ended up charging me for the day. $1200 and he would clear out as much as he could. The day of removal he came prepared. Breaking out the heavy machinery it took half the day to remove the oak and grind the stump. The other half was clearing everything else. I asked if he could leave me a few pieces of the oak tree. Being a woodworker I was sure I could find a use. One piece became a mushroom log. A few others became a couple pieces of furniture. Jesse Ware who he and his wife Melanie make up the YouTube channel "Road to the Farm", decided to showcase a recent project involving a fallen log. What tools did you use to complete this project? I used a chainsaw and a chainsaw disc on my right angle grinder. What species of wood do you or have you used to build log planters? The planters I have made are all pine. Any log would work, although hard wood would take a little more effort to hollow out. Does the size of the log have a bearing on the difficulty? A larger log means there is more material to use and is heavier which can be challenging to move the piece. But the weight of the larger log makes it more stable which makes it safer to work on. I guess there are pros and cons to both small and large logs. 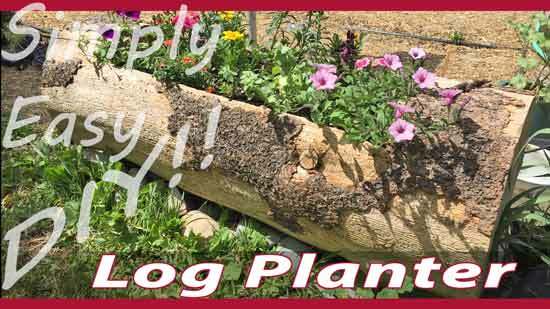 What are some of the draw backs you have encountered using logs as planters? The first log I made with a drainage hole in the bottom and it is hard to keep it watered enough for the plants to really do well. Log planters are pretty heavy and not easily moved. Especially once they are filled with dirt. Other than that, we have loved the log planters. Having built a few and being able to refine your technique for building log planters, are their certain tools or techniques you recommend using over others? I used a splitting maul, which I don't really recommend. It was too powerful a tool and ended up splitting the log. The chainsaw grinding wheel is highly recommend. It's a very effective, fun tool to work with. Some of the tools looked kinda dangerous. What safety gear do you recommend? Ear and eye protection. Chainsaw chaps and Kevlar gloves. Do you find it to be a difficult project to complete or just time consuming? In other words, can someone with little experience using the tools recommended build a project like this? Chainsaws should not be used without some basic training from an experienced chainsaw operator. 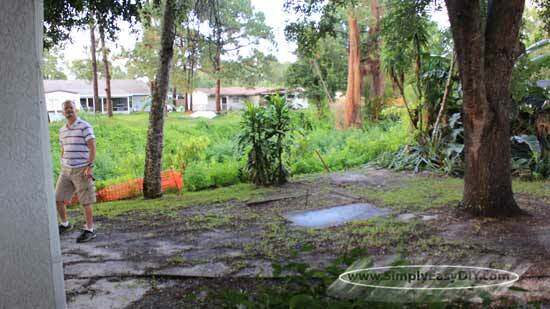 However, anyone that is comfortable with a chainsaw could easily complete this project. The size of the log will determine how much time it takes to hollow out. Jesse made the statement about drainage holes making it difficult to keep a small log planter watered well enough for the plants to do well. Actually this is something that all small planters without some sort of watering system have in common. Even if you buy a planter at a store, smaller planters require more frequent watering simply because of less volume, nothing more. Drainage holes should ALWAYS be included in a planters design. 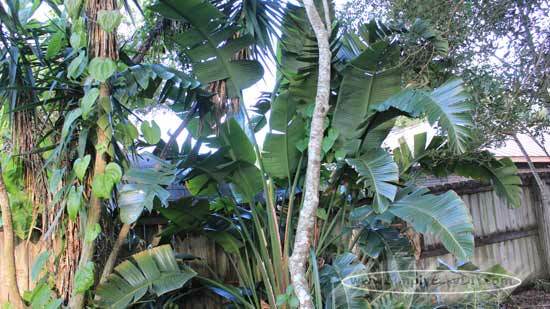 Not doing so can cause more problems than simply needing to water and fertilize more frequently. I recommend installing a drip irrigation styled system or a watering reservoir that doesn't require the planter to sit in the reservoir. I've made several planters and posted the videos here on this website and they never fail to produce the question asking how fast does that planter dry out. The answer is always the same despite the design. The smaller they are the faster they dry out. So have a plan in place to deal with it.